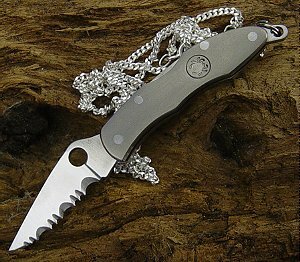 Description: The Spyderco Mini Police Necklace knife is a tiny little Titanium handled Necklace/Keychain knife with a great ATS-34 serrated blade. This entry was posted on Wednesday, November 24th, 2010 at 11:37 pm	and is filed under 2" or Smaller Knives, Designer - Sal Glesser, Handles - Titanium, Lock - Lock Back, Manufactured - Japan, Steel - ATS-34, Type - Folding Knife, Type - Keychain Knife, Type - Office Friendly. You can follow any responses to this entry through the RSS 2.0 feed. You can leave a response, or trackback from your own site. Is the spyderco police necklace for sale and if so how much? Sorry this site is just for model information.